The Peace Corps: What is it for? 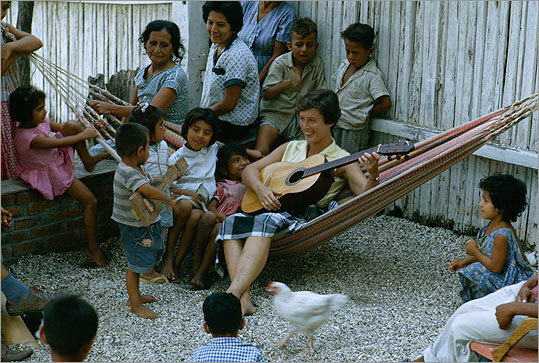 (David Boyer/National Geographic/Getty Images) A Peace Corps volunteer sat in hammock and played guitar with villagers in Tarqui, Ecuador. Fifty years ago this spring, President John F. Kennedy breathed life into what had seemed at first like simply an ingenious campaign promise: to send idealistic young people — “America’s best resource” — out into the furthest villages and towns of the developing world to boost the image of the United States abroad. This was the Peace Corps. In the years since, more than 200,000 Americans have served as volunteers, and the Peace Corps itself has become more than just another government agency. It has become an idea, the perfect embodiment of America at its best: selfless and unobtrusive, trying to do good in the world by helping the less fortunate achieve their potential. This year the agency is celebrating its 50th anniversary with a plethora of parties, expos, and panel discussions. A support lobby has coalesced around the motto “More Peace Corps,” asking for additional government money to fund even more volunteers. But as it celebrates, it is also being confronted with an uncomfortable doubt being raised by more and more of those who were themselves once those idealistic and young volunteers: The Peace Corps — an agency with a budget that reached $400 million in 2010 and which sends nearly 9,000 volunteers into risky environments every year — may no longer have a real purpose. priority it once was — leaving a large bureaucracy with no clear answer about what its objectives should really be. The call for reform has reached the eight-story Peace Corps headquarters in downtown Washington, D.C. Last June, for the first time in 50 years, it produced what it calls a comprehensive self-examination. (Congress had threatened to withhold its 2010 budget unless such an examination took place.) The report agreed with critics in part, concluding that the Peace Corps needed a new strategy that takes “into account the changing face of both the United States and the countries it serves.” It offered 63 recommendations, from more oversight to greater volunteer medical support. Kristina Edmunson, a spokeswoman for the Peace Corps, said in an interview for this story that only 12 of the recommendations had been implemented so far, but the Peace Corps considers the report a “road map” for the future. These attempts at change have not appeased the critics. What they would like to see, instead, is the agency make the tough bigger decision about what it truly wants to achieve, and then reshape itself accordingly. Steered well, they say, the Peace Corps could be a unique resource for investing energetic young volunteers with the power to make meaningful changes in the countries where they are stationed. What they fear, however, is that will increasingly slide toward being a corps of idealistic, well-intentioned young people sent to distant nations simply to socialize with other Americans like them. It did once make sense. When Kennedy first proposed the idea of a peace corps, he didn’t hide that his impetus for sending talented Americans into the field was to combat the phenomenon of Soviet “scientists, physicists, teachers, engineers, doctors, nurses,” from the Communist bloc “prepared to spend their lives abroad in the service of world communism.” And that kind of help was undeniably needed in the Third World countries of the time: When it became independent in 1960, for instance, the Belgian Congo had only 16 college graduates. By August 1961, the first groups of volunteers were leaving for Ghana and East Africa. Sargent Shriver, Kennedy’s brother-in-law, was the first head of the new agency, and he established three goals for the Peace Corps. Only the first was about development — “helping the people of interested countries in meeting their need for trained men and women.” The next two were about fostering in Americans a better understanding of the rest of the world, and providing the world with a chance to get to know Americans. But the problem, as a chorus of critics has been pointing out, is that the agency has never been structured to do development effectively. In fact, if you were trying to design an organization to avoid having a lasting impact, it might look a lot like the Peace Corps: inexperienced volunteers sent to work in near-total isolation from one another, with time limits guaranteed to make their impact only short term. Modern organizations set up to do meaningful development work look very different. They emphasize creating sustainable projects — ones that can survive after their founders have moved on. They usually operate from a central base, mostly in capital cities, and they try to learn from what works in the field and reproduce those results by applying them elsewhere. The Peace Corps, by contrast, is highly decentralized — and although its volunteers often have a much better sense of a community’s real needs than an aid worker sitting in an office in the capital, they are often powerless to do anything about it. Volunteers serve two years, and all Peace Corps administrators are subject to a strict time limit, which forbids them from working with the agency for more than five years. Volunteers describe feeling like they are constantly reinventing the wheel and then not even given the proper tools to do so. Dane Smith, the Obama administration’s senior adviser on Darfur, who was also a Peace Corps volunteer in Eritrea in the 1960s and onetime president of the National Peace Corps Association, highlighted these structural problems in his recent book, “U.S. Peacefare.” The agency “has never placed high priority on the development task,” he wrote. My own experience of the Peace Corps dovetails with Dickinson’s. As a volunteer from 1999 to 2001, I was assigned to teach English in a local high school — a place that already had plenty of people to teach English. I ended up instead spending most of my energy and time working with another volunteer to set up a community-run nursery school for children whose mothers were out each day farming. It was popular with the village, but the country Peace Corps office showed little interest in keeping it going after we left, or helping other volunteers learn from our experience. On my last day in Cameroon, I told the country director that I felt our real development work had been ignored. Wasn’t this type of project the point of my service? I asked him. “Not really,” he said. “The Peace Corps is more like development college.” Our nursery school closed after the next school year. This seeming lack of interest in carrying out of development work is one of the issues brought up in Ludlam and Hirschoff’s long memo. They were each volunteers separately in Peace Corps’ early years — Ludlam in Nepal and Hirschoff in Kenya — and then reenlisted after they retired, to serve in Senegal from 2005 to 2007. But this time, they said, they found a different organization. Gone was the young and limber agency they had joined in the 1960s. They have since become crusaders for a more streamlined and transparent Peace Corps. Among their recommendations, they suggest that the Peace Corps should put some resources at volunteers’ disposal in the form of seed money for projects — right now, volunteers have to raise any money they need — and, at the very least, document those projects that work so that other volunteers can easily replicate the successes. They also wonder whether the Peace Corps should abandon what they call a “go it alone” policy, and start collaborating with other big aid organizations. Combining volunteers’ knowledge of individual communities with the resources and institutional memory of these larger organizations could be, they suggest, a recipe for building a more valuable Peace Corps. When I asked Edmunson, the agency’s spokeswoman, about this broader complaint that the Peace Corps is not structured to carry out real development work, she gave me an answer that suggested the Peace Corps was more focused on the character-building side of its mandate. That lofty sense of virtue devoid of real mission strikes a lot of people as pretty fuzzy for an organization that is arguing for an even bigger budget and an increase in volunteer numbers. The Peace Corps needs to “start operating as an organization that is serious about efficiency and bang for the buck,” wrote Robert Strauss in a 2008 Foreign Policy magazine article. A former Peace Corps country director in Cameroon, he has become another of the more vocal critics through a series of high profile op-eds and articles over the past three years. What critics including Strauss want to see, before any expansion, is for the Peace Corps to tackle its structural problems. Assuming it does more formally embrace a mission as a development agency, it would need to start behaving more like one, working in concert with government and other groups to design programs that last. It would collect data and judge which programs were working and which should be abandoned; actively recruit older and more experienced volunteers and empower them to carry out projects; and, at the very least, modify the archaic five-year limit for any Peace Corps administrator. These might seem like basic steps for any group committed to achieving the things that its volunteers sign on for. Still, those who cherish the original idea of the Peace Corps aren’t necessarily sold: They wonder if all this talk of reform and change overlooks what is most central about the agency, that it allows Americans to interact with the world. This simple notion, they say, is what has made for the resilience of the Peace Corps over the decades. Gal Beckerman is a journalist who has written for The New York Times, The Wall Street Journal, and The Washington Post. His first book, ”When They Come for Us, We’ll Be Gone: The Epic Struggle to Save Soviet Jewry,” was published in September and won the 2010 National Jewish Book Award.